Robert Kolby Harper (left) helps Kaitlyn Johnson (right) with polishing her first impression in an audition. 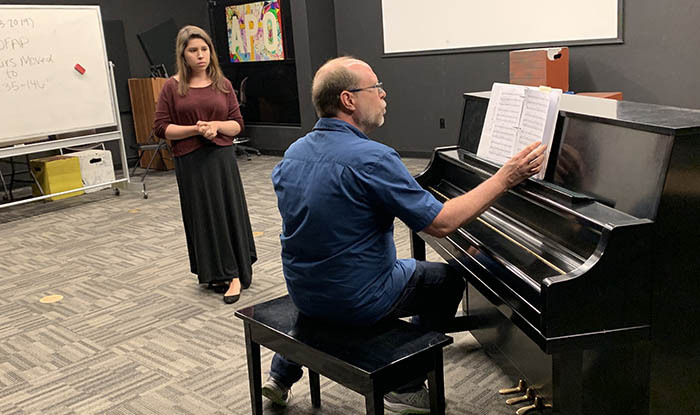 Spring break usually means time at the beach or sleeping in late, but not for Grand Canyon’s University’s College of Fine Arts and Production (COFAP) students, who had the opportunity to learn what to expect in an audition environment and how to make the best first impression. 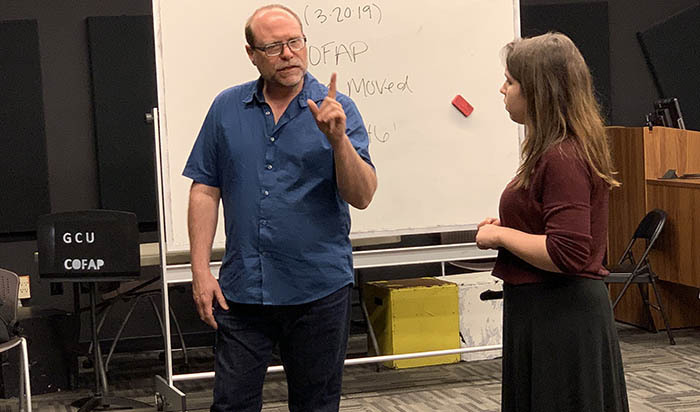 Robert Kolby Harper, Associate Artistic Director for the Phoenix Theater Company and an award-winning actor, director and choreographer in the Valley, led a workshop on campus to share his experience in the entertainment industry and teach students some tips and tricks. “This business is all about connecting, promoting yourself and relationships,” Harper said. “So the more they can start, especially at a college level, making relationships beyond the educational setting, that’s really important. “The GCU students, they have a slot for the Phoenix Theater Company for session generals for next year, and I oftentimes will come in and do an audition workshop every year, just to be able to meet them because I don’t get to interact with them every day. That way, when they come audition, there’s a friendly face. Students rehearsed monologues, learned how to build confidence and how to feel comfortable showing their true selves in auditions. “The biggest thing I take away from everything I’ve seen in what we’re doing here is just to be ourselves and try and shed the performance skin that we’ve all been built up to over the years,” said COFAP student Mykhal Polite. For some students, workshops like the one Harper offered over the break can be their first exposure to how to prepare for a professional audition. 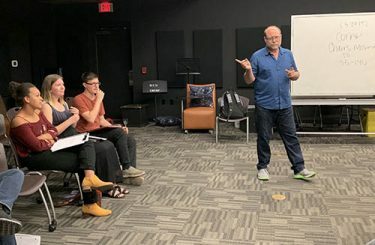 Harper teaches GCU theater students some tips and tricks for how to ace a professional audition. Gustavo Flores believes that just having the opportunity to get an outside perspective is also another benefit to the workshops offered on campus. “I think it’s really helpful, especially here on campus because they have a lot of excellent professors that can help out with everything, and having someone from an outside area come in is usually very helpful to get an outside point of view who doesn’t know you but can still help you achieve a goal,” he said. This isn’t the only opportunity COFAP students have as far as building connections on campus and learning how to approach the professional world outside of college. Assistant Dean William Symington and other mentors on campus have attempted to build connections and offer learning opportunities to their students with businesses outside of GCU. Senior Kaitlyn Johnson says the Theater Department continues to maintain relationships with various artistic outlets in the area. One of many ways the Theater Department strives to present the best opportunities it can to its students is to offer experiences so they can learn how to handle the worst- and best-case scenarios in the entertainment industry.